The octogon is the pattern trend of the year! This is a beautiful octagon monogram embroidery font in large sizes. Capital letters A thru Z, with left, middle and right letters to form an octogon shape as shown. 4.00 inch: 3.67 x 3.85 inches. SC: Avg: 10,343. Split Satin stitch. 5.00 inch: 4.77 x 5.00 inches. SC Avg: 13,827. Split satin stitch. 6.00 inch: 5.72 x 6.00 inches. SC: Avg: 17,286. Split satin stich. 7.00 inch: 6.68 x 7.00 inches. SC: Avg: 20,543. Split satin stitch. 8.00 inch 7.44 x 7.80 inches. SC: Avg: 26,880. Split satin stitch. 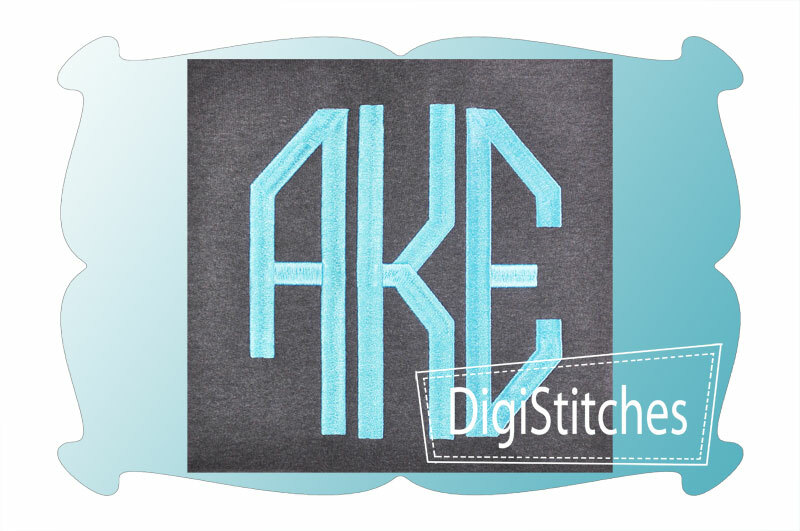 This is a beautiful octagon monogram embroidery font in large sizes.